The state-bound Bellbrook High School competition cheerleading squad. MIAMISBURG — The Bellbrook varsity competition cheerleading squad earned a qualifying bid to the state cheerleading competition after a solid performance at the Ohio Association of Secondary School Administrators (OASSA) Southwest Regional competition held Sunday, Feb. 4 at Miamisburg High School. The state competition will be held Sunday, March 10 at St. John’s Arena on the Ohio State University campus in Columbus. In the Non-Building category that will include Bellbrook, teams will perform a choreographed routine of two minutes and 30 seconds, which will include a variety of jumps, tumbling, motions and dance. The team has been working hard on their cheer, dance, and tumbling skills since their tryouts last spring. In 2018, Bellbrook finished 20th in the D-III Non-Building cheerleading state competition out of 21 teams. BELLBROOK — The host Bellbrook Golden Eagles boys high school basketball team rallied from a 20-17 halftime deficit to claim a 34-32 win, Saturday Feb. 2. Hayden Greene led Bellbrook with nine points scored while teammate Ryan Chew finished with eight. Tipp’s Nolan Mader led all scorers with 10 points. SPRINGFIELD — Host Kenton Ridge charged out to a 29-17 halftime lead and pulled away from there for a Saturday Feb. 2 boys high school varsity basketball win, 61-40, over Greeneview. Cole Allen led the Rams with 14 points. The no. 2 scorer in the Central Buckeye Conference — Kenton Ridge’s Tyler Eberhart — led all scorers with 27 points. RIVERSIDE — Host Carroll started and finished strong in a 48-32 win over the Chaminade Julienne Eagles, Feb. 2. Carroll got out in front 16-8 after one quarter of play, allowed CJ to out-score them 19-8 in the second and third quarters, then grounded the Eagles 24-5 in the final stanza. Megan Leraas led Carroll with 13 points scored, Sarah Ochs added 11 and Julia Keller finished with 10 in the win. YELLOW SPRINGS — The visiting Milton-Union Bulldogs outscored the host Yellow Springs Bulldogs 30-21 in the second half of Saturday’s Feb. 2 boys high school basketball game to claim a 50-47 win. No individual statistics were available for M-U, but they did out-score Yellow Springs 22-11 in the third quarter. Trey Anderson was Yellow Springs’ top scorer with 15 points, and DeAndre Cowen finished with 14. WEST CARROLLTON — Evelyn Oktavec scored 25 points while Natalie Oktavec and Khala Powell scored 17 each in a 74-50 win over the host Pirates, Feb. 2, in girls high school basketball. Fairborn led 18-2 after one quarter of play. CEDARVILLE — Colby Cross knocked in a game-high 20 points, Trent Koning finished with 16 points scored, Isaiah Ramey scored a dozen points and Benjamin Tarwater also got into double-figure scoring with 10 in Cedarville’s 64-48 win Feb. 2 over East Clinton in a boys high school varsity basketball contest. The Indians are now 9-8 overall, 7-5 in the Ohio Heritage Conference’s South division. TROTWOOD — Fairborn grabbed an early 21-17 lead, then it was all Trotwood-Madison the rest of the way Feb. 2 in a 105-62 Rams boys high school basketball win. The Skyhawks were led in scoring by Joe Nickel who had 16 points. O.J. Person added 15, Tylen Eatmon added 11, and Shaunn Monroe added 10 for the Skyhawks. Fairborn is back in action at 7:30 p.m. Tuesday, Feb. 5 versus visiting Piqua at Baker Memorial Fieldhouse. SPRINGFIELD — Host Catholic Central outscored Cedarville 4-2 in overtime to claim a girls high school basketball varsity win Feb. 2. No individual statistics were available for Cedarville (14-6, 10-5 Ohio Heritage Conference South). CC’s Abigail Peterson led the Irish (14-4, 9-3 OHC South) with 26 points. ENON — Host Greenon limited Greeneview to four points or less in three of the four quarters played, in Saturday’s Feb. 2 36-17 Greenon girls high school basketball win. Rachel Strickle led the Rams (15-4, 12-2 Ohio Heritage Conference South) with six points. In the junior varsity game, Greeneview grabbed a 28-26 win, with Madyson Ackerman and Karley McDuff scoring seven points apiece. JAMESTOWN — Greeneview competed well in the Feb. 2 Jim Matson Junior Varsity Invitational against Centerville, Beavercreek, Springboro, Fairmont, and Xenia’s swim teams. Placing first for Greeneview was Kalyn Biggs in the 50-meter butterfly and the 50 breaststroke. Also making the podium with a first-place finish was Cameron Bolen in the 100 breast. XENIA — Xenia Warner’s eighth-grade boys basketball team improved to 10-3 with a 68-35 victory over Mad River. Shawn Thigpen led the Bucs in scoring with 17 points. Nate Fellie and Damien Weaver each scored 10, Tawfiq Jabbar scored nine points, Tremell Wright and Trei’Shaun Davis-Sanders each scored seven, Blake Owens had five, and Austin Penewit added three. MOBILE, Alabama — Spring Hill College’s Ester Stokley scored with five seconds left to play to earn the hosts a 62-60 win over Central State University, Feb. 2 in a women’s college basketball Southern Intercollegiate Athletic Conference game. Falon Edwards paced the Marauders (8-14, 5-8 SIAC) with 14 points, six steals and six rebounds. Jaeda Davis added 12 points. Takyra Gilbert and Chervelle Cox each recorded 11 points. Spring Hill’s Katie Krout led all players with 28 points and 16 rebounds. Tiffany Valentine finished with 17 points, eight rebounds and five assists. SHC improves to 10-11 this year with a 6-6 conference record. MOBILE, Alabama — The Spring Hill College Badgers used a 19-2 second half run to cruise to a 97-79 victory over the Central State Marauders on Feb. 2 in a men’s college basketball game. Tom Johnson led the Marauder offense with a season-high 20 points, converting seven of 11 shot attempts. Despite a lower back injury, Orion Monford scored 19 points in 26 minutes of action. Randall Clarkson, Jr. added 13 points off the bench. SPRINGFIELD — Host Emmanuel Christian (13-4, 8-3 in the Metro Buckeye Conference) shot 60 percent from behind the 3-point arc in a 75-60 boys high school basketball game Feb. 1. EC’s Adonis Davis led all scorers with 23 points. Legacy’s Keano Hammerstrom led the first-place Knights (16-3, 10-1 MBC) with 21 points while Roman Newsome and Erik Uszynski scored 11 each. TROY — After being down 19-15 at the half, host Troy Christian outscored Yellow Springs 41-22 in the second half to claim a 56-41 boys high school basketball win, Feb. 1. Kevin Wagner led the Bulldogs in scoring with 12 points, Trey Anderson and Andrew Clark scored eight points each, and DeAndre Cowen finished with seven in the loss. RIVERSIDE — The visiting Fenwick Falcons made a 27-21 halftime lead hold up, in a 44-40 road win over Carroll on Feb. 1. Fenwick’s C.J. Napier led all scorers with 18 points. Carroll’s Austin Schafer led the Patriots with 17 and Matt Cogan finished with 14 in the loss. RIVERSIDE — Despite Shaunn Monroe’s game-high 31 points for Fairborn, host Stebbins claimed a 62-57 win on Friday, Feb. 1. O.J. Person added 12 for the Skyhawks. KETTERING — Visiting Xenia outscored the Fairmont Firebirds 33-30 in the second half, but the Buccaneers couldn’t overcome a 50-35 halftime deficit, Feb.1 at Trent Arena. Samari Curtis finished with 19 points, Dylan Hoosier added 14 points, Zack Gaither had 11 points and Noah Crawford finished with 10 in the loss. Fairmont’s Ryan Hall led everybody with 22 points. JAMESTOWN — Anna Willingham rolled games of 206 and 150 for a match-high 356 two-game series and the Greeneview High girls varsity bowling team claimed a 1,651 to 1,565 win over Fairbanks on Jan. 28. Other Rams series scores were tossed by Lauren Reagan (238), Emily Crum (182) and Jackie Kasner (211), with single-game scores contributed by Breanna Pugh (84) and Ruth Coe (128). JAMESTOWN — Greeneview’s Braedan Brennaman rolled the top two-game series of the match, a 183-214 — 397, but Fairbanks came away with a 2,437 to 2,229 boys high school varsity team bowling win Jan. 28. Adam Schornak rolled a 318 series, Steven Ross rolled a 314, Brysten Bosier turned in a 287, while teammates Darian England (143) and Sam Warner (152) contributed with single-game scores. 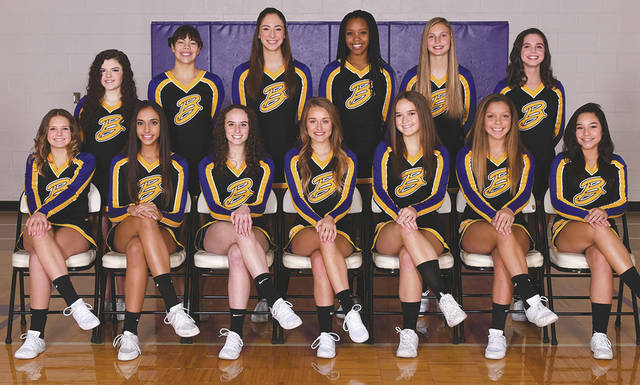 https://www.fairborndailyherald.com/wp-content/uploads/sites/50/2019/02/web1_BellbrookCheerleaders_PS.jpgThe state-bound Bellbrook High School competition cheerleading squad.